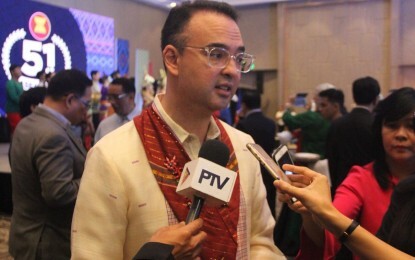 Foreign Affairs Secretary Alan Peter Cayetano said Friday the government has yet to receive word from Washington amid circulating reports that the US defense secretary had announced the return of the Balangiga Bells to the Philippines. "Wala pang official transmission sa amin sa DFA (The Department of Foreign Affairs has still not received any official transmission regarding the bells)," Cayetano said, when asked to confirm the veracity of a viral post on Facebook claiming such. As of posting, the post has more than a hundred shares already. The latest development, he said, was the signing of the US National Defense Authorization Act of 2018, which gives the US defense chief the authority to decide on the bells' transfer. "Ayokong pangunahan 'yung official na approval nila pero parang nago-open 'yung mga pinto, dati sarado. Dati kasi, Congress can block it, ngayon binigay nila 'yung desisyon sa defense (I don’t want to preempt the official approval but doors that were once closed seem to be opening. In the past, the US Congress could block it but this decision has been given to defense)," Cayetano told reporters in an interview in Taguig City. While there are still "sensitivities" to address, the foreign affairs chief noted that both Filipino-Americans and Americans facilitating for the bells’ return are seeing developments favoring President Rodrigo Duterte's desire to get the war booty back. "Sabi ng mga taong nag-aasikaso doon, both mga Filipino-Americans at mga Americans, maganda ang takbo. We're doing it quietly, diplomatically but mukhang may way forward (According to people in the US who are facilitating the return of the bells, both Filipino-Americans and Americans, things are going well. We’re doing it quietly, diplomatically, but it looks like there’s a way forward)," he said. The bells were taken from the Balangiga Church in Samar by American troops as a war booty from the "Balangiga Massacre" in 1901. Duterte first demanded for the return of the bells during his second State of the Nation Address last year. Before officially assuming his role as Ambassador to the US in 2017, Jose Manuel Romualdez said the bells may be returned to the Philippines "soon." Prior to the US National Defense Authorization Act of 2018, Romualdez said Defense Secretary James Mattis has already assured Duterte that "he will do what he can" to bring back the war artifacts.